On recalling my childhood days and fondness towards spicy chaat and crispy golgappas ,Nutkhut is the first name that strikes my mind and makes me nostalgic. Nutkhut Caterers is a small stall known for its golden hot tikki, sweet and sour Lachha tokri and charcoaled panir tikka , Nutkhut is one of the oldest and most loved chaat corner in the Gujrawala town. 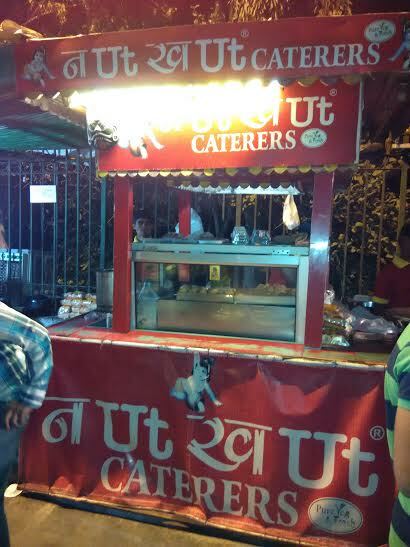 Most interestingly, it was the first street joint in North Delhi to serve pani puri made from mineral water. Its crispy aloo chaat and bhalla papdi too has some charismatic power in it that attracts foodies like magnets. Adjoined by various other small street food joints serving different cuisines, Nutkhut enjoys its reputation and popularity amongst food enthusiasts who gather at the stall every evening. This time on my visit to Nutkhut, I decided to go for something different so I tried marinade soya chaap roll, served with lemon and onion along with green chutney. It was superbly delicious , full of spices and exploded like a bomb in my mouth. Fairly priced at Rs 160 , the serving was so generous that two eagerly starving people can easily be fed . With its promising quality of food, Nutkhut chat corner has proved that it is not just limited to “chaat” but also stands excellent in its soya dishes. Nutkhut also has another branch in Model town and a catering outlet named Nutkhut Rasoi near Gola Northend that serves delicious Indian cuisines and is best for home delivery. Its Special paneer thali is favourite amongst people. So, next time you visit Gujrawala town, don’t forget to take a hault at Nutkhut chaat corner .